PGSM. Character. セーラージュピター The fourth senshi to be found. First appeared in Act 5. She controls the power of thunder, lightening, and flowers. She is very strong and dedicated. Around her waist she wears a pink ball of potpurri and she always wears rose earrings. PGSM. Character. セーラールナ The last senshi to appear. First appeared in Act 26. Sailorluna is cat Luna's human form. She appears during the time when Dark Mercury is fighting the senshi. Their first battle is on a rooftop. Sailorluna is a mix of kid-like and cat-like in her actions. She will chase balls in a toy store and is afraid of dogs. If she sneezes or is suprised she will turn back into a cat. PGSM. Character. セーラーマーキュリー The second senshi to be found. First appeared in Act 2. She controls the power of water and ice. She is very smart and loyal. In Act 22, Sailormercury comes under Kunzite's control and transforms into her evil self, Dark Mercury. PGSM. Item. セーラースタータンバリン Attack weapon from Sailormars, Sailormercury, Sailorvenus, and Sailorjupiter. It can be used alone or in a group. 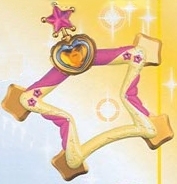 In the Final Act the Tambourines are transformed into other weapons by the senshi. PGSM. Character. セーラーＶ The first senshi to appear. First appeared in Act 1, stopping Tuxedo Mask from stealing jewelry. In Act 12, reveals herself as Princess Sailor Venus. As Sailor V, she is a loner. She is strong, quick, and flexible. She carries a crescent moon as a weapon. PGSM. Character. セーラーヴィーナス The last senshi to join the group, but the first to become a senshi (as Sailor V). First appeared in Act 1 as Sailor V. In Act 12, reveals herself as Princess Sailor Venus. She is strong and dedicated. Around her waist she wears a chain to use for attacks and also carries a crescent moon as a weapon. PGSM. Actress. 沢井美優 (さわいみゆう)The actress who played Sailormoon/Tsukino Usagi in the live action. She was born October 23, 1987 in Kanagawa, Japan. She has appeared in the movie Jun and in the TV drama Kids War 5. She has also released several idol DVDs and photobooks and appeared in magazines and commercials in Japan. PGSM. Actor. 渋江譲二 (しぶえ じょうじ) The actor who played Tuxedo Mask/Chiba Mamoru in the live action. He was born March 5, 1983 in Nagano, Japan. He is interested in raquet sports, darts, and music. He has also appeared in an informercial and Hotdog Press magazine, and Junon. PGSM. Attack. 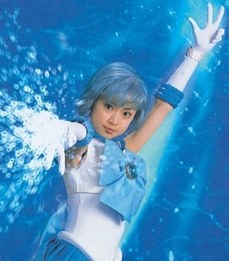 シャイン・アクア・イリュージョン Attack used by Sailormercury in the live-action. She shoots a blast of water energy at her enemy. First used in Act 9. PGSM. Attack. 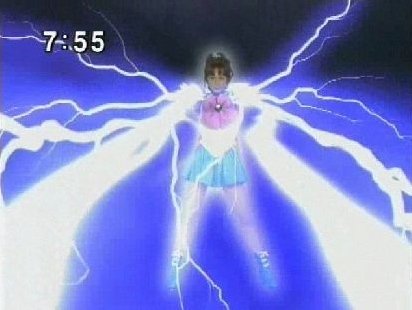 シュープリーム・サンダー Attack used by Sailorjupiter in the show. She shoots the energy from her hands in the form of streaks of lightning. First used in Act 6. PGSM. Item. 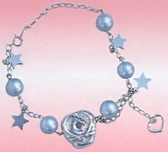 銀のブレスレット Bracelet worn by Sailormars, Sailormercury, Sailorvenus, and Sailorjupiter. When they transform it becomes the Jewelry Star Bracelet..